Dr. Saleem Naik is an MBBS post graduate from Bundelkhand Medical College. In 2002, he did MS from Pt. Ravishankar Shukla University, Raipur and went ahead with DNB in Surgical Gastroenterology from National Board of Examinations, New Delhi in 2008. 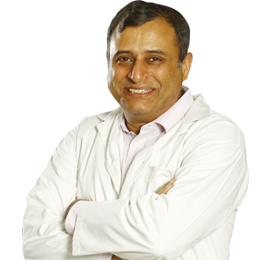 His main expertise lies in Laparoscopic GI Oncology, Surgery for Morbid Obesity, Hepatopancreaticobiliary Surgery, Management of Post Cholecystectomy and Bile Duct Injuries. He has experience of 15 years in these fields and has served in some top names like GB Pant Hospital, BLK Super Speciality. Senior Resident. Rajiv Gandhi cancer Hospital. January 2003 to June 2003.